Would be good to leave short notes like "too much downforce", "tires last 20 laps",.. Rating system only tells so much. Maybe limit comments in length and only one comment per setup/player, so that it does not turn into a chat? IIRC, FBM did have only six, so 7th is reverse? But I still don't get the ratios itself, would expect them to increase/decrease in one direction only, not getting lower from 1st to 5th, then 6th being higher. 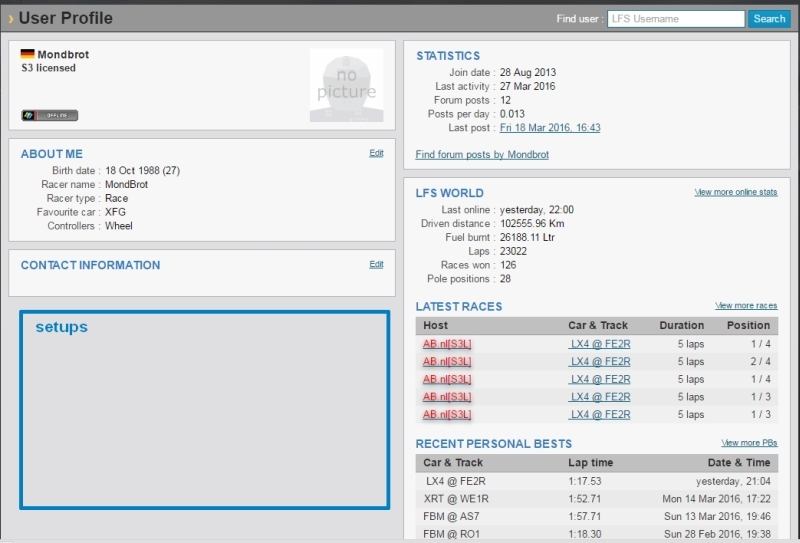 It would be useful, for the sets that did not come from LFSW Hotlap list, to be able to be added a lap time. Maybe connect it to the driver's PB on that particular track by default or let it be set manually? Question for the coders /experts: Would it be possible to write an insim app so I could download setups while being ingame? IIRC, FBM did have only six, so 7th is reverse? ah thanks, that was a bug. Now fixed. It indeed has only 6 gears. Reverse isn't counted. Quote from three_jump : Cool stuff! It's possible. Daniel-cro already offered to make that, if I provide an API, which I guess will happen soon enough. I see Troy got access to this way sooner than us! Anyway, it's really good that we have an official setup database now. One note: could you make it that when I hover my mouse over the full track name, a little image pops up with the track configuration and it's short name? Last edited by Sobis, Fri, 25 Mar 2016 17:24 . Quote from Sobis : E: We can't upload our own setups, only from LFSW replays? I've added all setups that have been uploaded to the forum over the years, as a starting point for the database. I've added a track preview + short name to the main setups page. You see it when you hover over a track name. I'm wondering if it should show whenever a track is highlighted, not just when you hover over it. Last edited by Victor, Fri, 25 Mar 2016 18:13 . You can now add your own notes to others' setups as well, provided you are logged in. I've capped the length to 300 characters at the moment. Yay, finally don't have to depend on the outdated setupgrid as a noob driver. Woo, the comment function! Great job! Quote from Oveglfhzl : Yay, finally don't have to depend on the outdated setupgrid as a noob driver. Yep, we can all say we don't have to depend on Setupgrid now. I'm sure that after some time there will be a lot of fast and good setups available here. Speaking of, I've never been a fan of the 5-star rating system. I n my opinion it does not provide enough granularity -- Most "decent/good" <whatever> end up with 4 or 5 stars so it can be hard to separate the good setups from the great ones. - Do you recommend this game? (Yes/No). - Optional review (/comment) box. Rating: x% of the y user reviews for this game are positive. Then they go crazy with allowing users to review another user's review but that's not really necessary, I guess. Any other thoughts? Perhaps a 5 grade rating is sufficient regarding setups. When looking at the car setups I rated a setup by accident. I was able to figure out how to remove my rating but perhaps a undo button could fit in there somewhere? Quote from Victor : You can now add your own notes to others' setups as well, provided you are logged in. Comment section looks good, I got some troll comment/rating though from a demo user on a rb4 set. Can you see number of downloads at the moment? I couldn't find it. In the user profile there is some space on the bottom left, maybe the sets of the user could be shown there? Last edited by cargame.nl, Thu, 15 Sep 2016 17:41 . Quote from cargame.nl : Ye... Not sure why demo people need to see licensed setups to begin with. I guess some licenced people are too lazy to login to lfs.net to download setups. Also if setups are public (accessible through google search) it will be much more popular. I don't see any harm in them seeing the setups, but it seems to make sense to disallow comments on licensed setups from demo racers. Why should they comment on something they can't even try? I've disabled comments for demo users. You now must be logged in and have at least an S1 license to be able to comment. So that also goes for demo setups. Ideally I'd allow demo racers to comment on demo setups, but I'm afraid that'll be abused. Everyone can still post comments for their own setups though. Rating has also been disabled for demo racers, for the same reason. I'm considering allowing this again if I can use a better averaging algorithm that takes abuse into account. Finally I've removed all spammy setup comments (4 or so, out of 125). A small request : would it be possible to have a pair of scroll lists inside a combo menu in aim to switch the car or the track easier than to come back to overview menu and looking for the wished combo ?